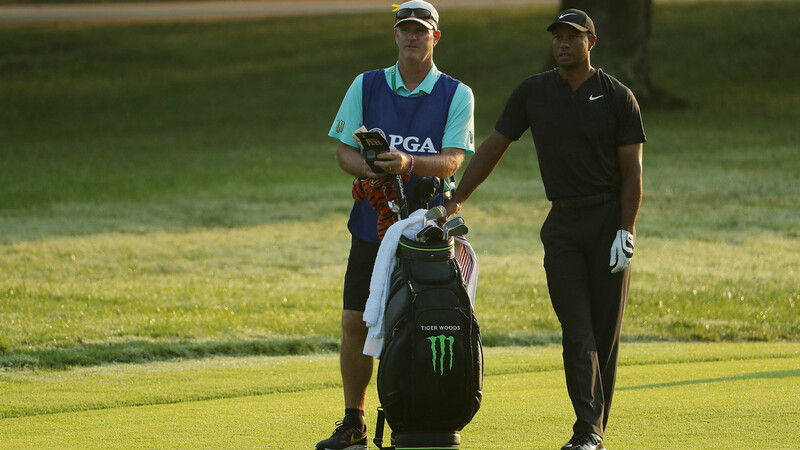 Tiger Woods returned to work Saturday morning as the storm-halted second round of the 100th PGA Championship resumed with the 14-time major winner seven strokes behind leader Gary Woodland. The 42-year-old American, who hasn’t won a major title since the 2008 US Open and hasn’t won any event in five years, sank a 14-foot birdie putt at the second, a five-footer to birdie the par-3 third and a 10-foot birdie putt at the fifth hole, then dropped in a 15-footer to salvage par after finding a bunker at the par-3 sixth. “I felt I was headed in the right direction,” Woods said. Storms halted play with half the field of 156 still on the course, the rain-soaked layout having surrendered three rounds Friday to rival the lowest in major golf history. Woodland fired a four-under par 66 Friday to seize the lead at 10-under 130 for 36 holes, one stroke ahead of fellow American Kevin Kisner with compatriot Brooks Koepka, the two-time reigning US Open champion, next on 132. Kisner, Koepka and South African Charl Schwartzel each flirted with the lowest all-time major round of 62 fired by South Africa’s Branden Grace in the third round of last year’s British Open at Royal Birkdale. Kisner birdied the seventh hole, his 16th of the day, to reach 7-under but found a bunker to par the par-5 eighth and chipped 25 feet beyond the cup and two-putted to bogey nine for a 64. Koepka birdied the eighth but missed a 19-foot birdie putt at nine for a 62, settling for a 63, matching the lowest round in tournament history. Schwartzel, the 2011 Masters champion, birdied the par-3 16th to reach 7-under but found a bunker off the tee to par the par-5 17th and left a 49-foot birdie putt at 18 six feet short before knocking in the testy par putt for a 63. That left Schwartzel level for fourth on 133 with world number one Dustin Johnson and Belgium’s Thomas Pieters. On the course at 7-under overall through 10 holes was Rickie Fowler, who has had eight top-five major finishes without a victory. Fellow Americans Billy Horschel and Pate Perez were on 5-under when play resumed. Low-hanging fog was still in the air as players warmed up on the driving range before the restart. China’s 45th-ranked Li Haotong did not return to the course, withdrawing due to a wrist injury with seven holes to finish in his second round. He started the back nine double bogey-bogey to stand 4-over when the storm struck.